Parking was easy, all of the staff were friendly, I waited less than 5 minutes for Dr Le and she thoroughlywent over all of my issues and gave helpful advice. Happy to have found a hassle free doctor in the area. Parking was easy, all of the staff were friendly, I waited less than 5 minutes for Dr Le and she thoroughly went over all of my issues and gave helpful advice.Happy to have found a hassle free doctor in the area. The building and elevator are a bit old, and there is a parking fee, but the front-desk staff, medical assistant, andDr Le are all professional, courteous, and comprehensive in addressing my health questions and concerns. The building and elevator are a bit old, and there is a parking fee, but the front-desk staff, medical assistant, and Dr Le are all professional, courteous, and comprehensive in addressingmy health questions and concerns. 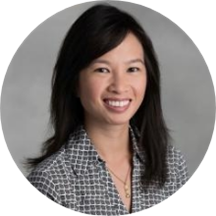 Born and raised in Orange County, Dr. Carolyn Le studied biological sciences at UC Irvine before attending medical school at Saint George’s University in Grenada, West Indies. She has since lived in Brooklyn, NY and the Central Valley in California and is excited to now be living in the Bay Area. Dr. Le thrives on the variety offered by all areas of family medicine, and particularly enjoys pediatrics, women’s health, and minor office procedures. Her practice goal is to help patients stay healthy by making healthy choices, staying active, and having access to appropriate resources and preventive care. In her spare time, she enjoys cooking, baking, and trying new foods, as well as hiking, biking, and exploring new places. Absolutely wonderful. Nice, with a great mixture of being both objective and empathetic. Very easy to talk to comfortably. My visit with Dr. Le was great, very good doctor! Dr Carolyn was very friendly and helpful, she took the time to answer all my questions.